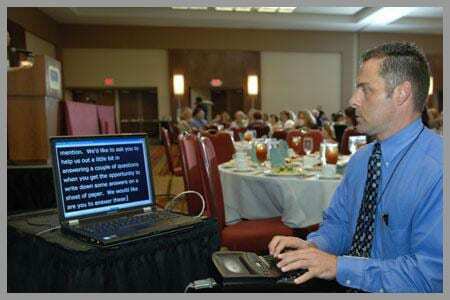 “Computer-aided transcription services” has since become known as “real-time captioning” or Communication Access Realtime Translation (CART) services, a professional service that can be delivered on location or remotely. CART services can be described as “the instant translation of the spoken word into English text using a stenotype machine, notebook computer and realtime software.” The text produced by the CART service can be displayed on an individual’s computer monitor, projected onto a screen, combined with a video presentation to appear as captions, or otherwise made available using other transmission and display systems. Call now to learn more about CART services 24 HOUR Sign Language Services.